2017 Edit: note that date because this entry was made before I switched to a plant-based diet. However, I'm still keeping this as an archive. I watching Food Network, and when I saw Melissa d'Arabian make this, I immediately thought of "Orange Chicken." The classic Chinese take-out item has definitely been a guilty pleasure, and I wondered if this recipe would be a cleaner alternative? Well, I am proud to report that it went beyond expectations! So much, that the next time I did order so-called "Orange Chicken," it wasn't up-to-par and I am no longer tempted by the fast food version. Because of that reason, I re-created the video from my mom's kitchen to share my satisfaction. - First, make the orange glaze, by adding the 1/2 cup of frozen orange juice concentrate and the 4 tablespoons of honey to a saucepan, and season with salt and pepper. Bring to a boil on medium heat, and boil for three minutes. - Preheat the oven to 375°. - Generously salt the 2-3 bone-in chicken breasts, and pat in. - After the salt has been patted-in, lubricate a sauté pan with the 1 Tbsp. of vegetable (or coconut) oil. - Skin-side-down, sear the chicken breasts for approximately five minutes, on medium-high heat. You want a crispy golden brown, so adjust the time, according to that look. - Once you've achieved the crisp, flip the chicken, so that they are now skin-side-up, and apply a coat of the orange glaze. - Halfway through the cooking time, remove the sauté pan, and apply another coat of glaze. 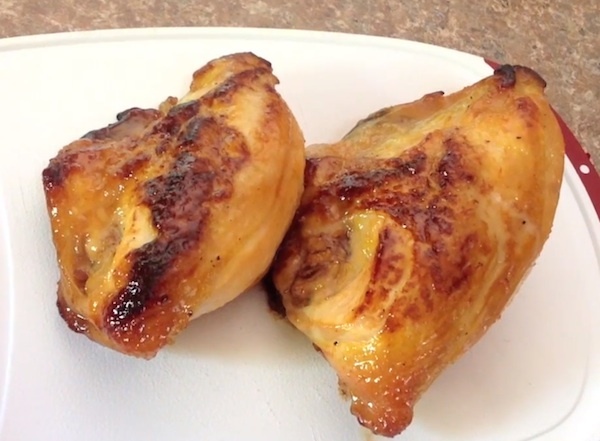 - Optionally, when the chicken is finished, you can throw on another coat of glaze. - Serve with a side dish that will counteract sweet, to give your mouth a full array of flavors. Or, if you're like me, just put it on a bed of rice and enjoy this sweet entree.